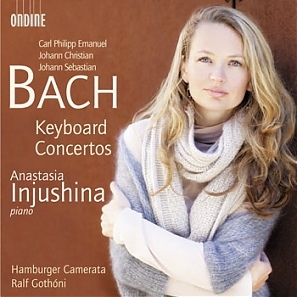 Ondine is proud to announce the release of a new album of keyboard concertos by Johann Sebastian Bach and his sons Carl Philipp Emanuel and Johann Christian Bach. Featuring some of the most beautiful and popular keyboard concertos of the composers' output, these works are played here on a modern piano by the striking pianist Anastasia Injushina, who is joined by the Hamburger Camerata and conductor Ralf Gothóni. Anastasia Injushina, the First Prize Winner of the ARD competition in Munich, among other awards, has performed widely internationally and has made numerous recordings for radio and television. Her artistry is renowned for her particular poetry and sensitivity which has attracted some of the world's top musicians to join her in performing chamber music. Her strong relationship to chamber music has been a thriving force of her career and she has been the artistic director of the Springlight Chamber Music Festival in Helsinki since its commencement in 2009. The Hamburger Camerata is known for its wide-ranging, unusual and sophisticated programs together with its commitment to both the classical repertoire and contemporary music. Ralf Gothóni has appeared at the world's most distinguished music festivals and with prominent European and American orchestras both as pianist and conductor - often in a dual role, conducting the orchestra from the piano. The album features CPE Bach's Concerto in D major; JC Bach's Concerto in D major and Concert in E flat major; and JS Bach's Concerto No. 2 in E major. See the video "The making of Bach Keyboard Concertos"